Construction will begin this summer on a new 72,000 square- foot residence hall on River Campus overlooking the University’s Brian F. Prince Athletic Complex. Planned to house 151 first-year students, its design integrates academics, athletics, and student life into the residential experience. It is scheduled to open in fall 2017 as a modern, air conditioned facility, which will also target LEED (Leadership in Energy and Environmental Design) designation for sustainable construction, operations and landscaping. The top four floors of residential space will feature single and double bedrooms. Lounges on these levels will have ceiling-high windows to maximize sunlight. The main level will be dedicated to academic and student life services with meeting rooms and offices. This space will include meeting rooms for study groups and workshops, and offices that will be available for health professions, as well as career, academic, fellowship and STEM advising. The lower field-level of the building will feature new varsity athletics locker rooms for men’s and women’s teams, as well as sports medicine and team equipment rooms. 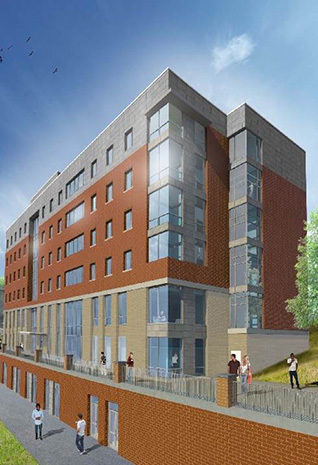 The new residence hall will be a housing option for first-year students, adding to the first-year housing and programming in the adjacent Susan B. Anthony Hall. With its proximity to the Prince Athletic Complex, it can also efficiently be used for summer camps, programs, and conferences. The concept for the project is by Ayers Saint Gross, Architects and Planners, the same firm that designed O’Brien Hall, which opened in 2012 on River Campus. The design build team is The Pike Company in association with SWBR Architect. The Prince Athletic Complex—made possible by the generosity of University Trustee Brian F. Prince, ’86, ’89S (MBA)—includes Fauver Stadium, North Field, Lyman Outdoor Tennis Center, and Towers Field.